Unless you received prior permission from HIT BLITZ, you may only register for one HIT BLITZ account. You may not promote HIT BLITZ in a way that could be considered spamming. You may only promote your referral URL and/or other promotional material in other traffic exchanges or advertising programs that allow it. Promoting HIT BLITZ in a way that could be considered spamming will result in removal of your HIT BLITZ account and possible legal action. Users are completely responsible for the content they promote using HIT BLITZ. Users are responsible for ensuring they have the rights to promote a URL, and any content it contains. HIT BLITZ is not responsible if a user is in violation of another legal agreement, copyright infringement, or any other issues. Before submitting a URL to HIT BLITZ, please read these rules very carefully and make sure your URL does not violate any of them. If you violate any of these rules, your site will be deleted along with any credits assigned to them. Your HIT BLITZ account may also be deleted. 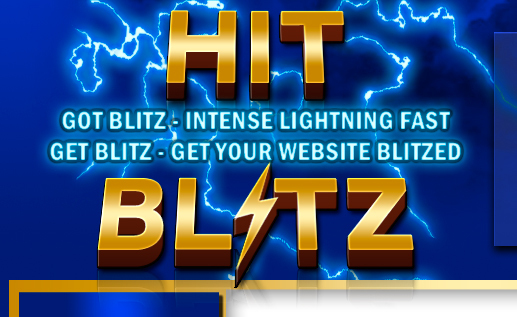 *HIT BLITZ has the full right to delete any site that is inappropriate or questionable. We offer no refunds Once you pay for advertising it is used and its not an item that can be returnedIf you are the scammer type that buys advertising and then wants a refund please don't join or buy anything from us. Your Ip will be banned your payment account address will be banned in our system wide security system across thousands of network sites. If you have an active subscription you can choose to cancel it any time. If you have any doubt about this site please don't join or buy a thing.